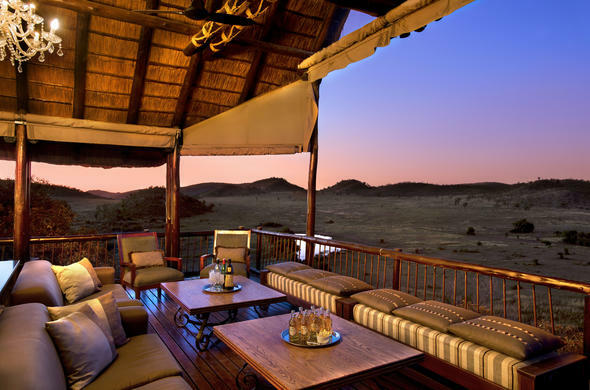 Tshukudu Bush Lodge is a luxury north west safari lodge situated in the Pilanesberg National Park. Situated above the African plains in the malaria free Pilanesberg National Park, the Tshukudu Bush Lodge is known as one of the most romantic Africa safari lodges. This North West safari accommodation is nestled within the remains of an extinct volcano and wildlife generously flow through the area. Look forward to excellent game viewing opportunities while on a game drive or guided game walk. The Pilanesberg National Park is home to the Big Five, namely Buffalo, Rhino, Elephant, Leopard and Lion. Stay in luxury at this northwest safari lodge. Each exclusive cottage has its own private balcony with views of the waterhole and African bush. The beautiful African theme sunken bath boasts views over the plains below. Each cottage also has an open plan lounge with fireplace.